Nothing can bring out emotions the way sport does. It brings out the child in a mature, wise man and causes even the toughest of eyes to shed tears. And once you attach yourself to a sport, it does not matter at which level you are competing; every single game is played to be won. The grand finale of WPL (Water Resource Department Premier League) 2012 presented a classic example of the passion that sport brings out in people. 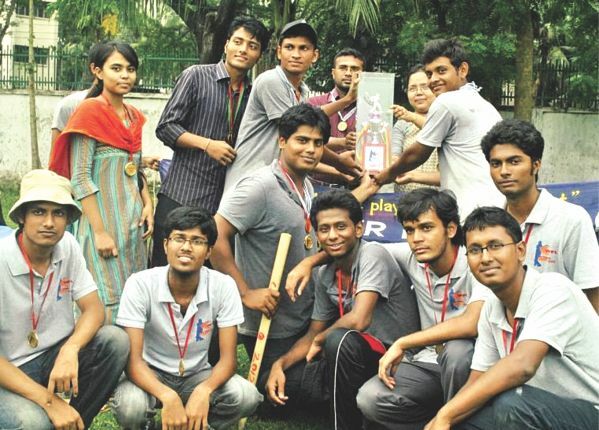 The game took place in Bangladesh University of Engineering and Technology (BUET) recently. The game had a similar model like the International Cricket Premier Leagues played worldwide. There were six teams respectively, which were Manning's IX, Bernoulli's Burners, Venturi Fighters, Water Spouts, Water Dragons and Duronto Torongo. Undergraduate students of all current batches were the players, owners and managers of the teams. There was a special alumni team named Alumni Kings, which comprised of teachers and alumni students. Teams were formed by bidding. The inauguration was held on May 18, 2012. Head of the Department Dr Umme Kulsum Navera, Professor Dr Md Sabbir Mostafa Khan, Professor Dr M A Matin and the President of 'Water Resources Student's Association' Professor Dr Md Ataur Rahman were present at the occasion. Final match was held on June 1 between Manning's IX and Water Dragons, where Water Dragons won the WPL. At the end of the match, the Head of the Department praised the students for holding such a successful event and distributed prizes among the winners and runner ups. “You try to grow leadership and sportsmanship through these kinds of events,” said Dr Navera to the students. More sports events on campuses can bring in students to work and aspire together.